I am not a big sandwich eater and as a result we tend to eat other foods for lunch at home. This tradition has continued since both girls have started school. They will go through short spurts of requesting sandwiches but most of the time they ask for alternatives. While cold meat and salad is my go to sandwich alternative, with many days and years of school lunches ahead of us I like to have other choices on offer. Here are some or our favourite sandwich alternatives, and some tips for general tips for school lunches from my years as a teacher and a mama. It is always a good idea to introduce (potentially) new lunch box foods at home first and school holidays/vacation offer the perfect opportunity to do so (though weekends work well too). 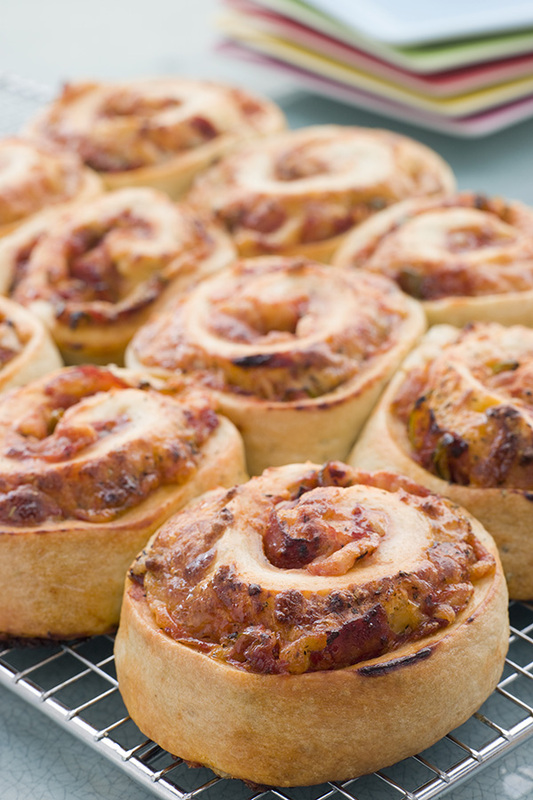 For example, Immy and I experimented with pizza scrolls (like those shown above) during the recent school holidays. A small, wide mouthed thermos is great for keeping lunch foods warm. 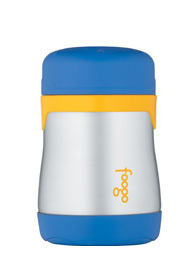 We have a Foogo by Thermos. Just like new foods, give your child the opportunity to use any new containers at home first. I try to balance Immy’s lunch box by being sure to include a serve of carbohydrate (preferably those of the slow release kind for sustained energy), protein and dairy each day, alongside with a fruit and a vegetable. If you are looking for more ideas, and hang out on Pinterest, my Lunch Box Ideas board which contains links to recipes for many more suggestions. You can follow me on Pinterest here. These suggestions are based on my research and experiences as both a teacher and a Mum, they do not constitute nutritional advice. Do you have any suggestions to add to our list of sandwich alternatives? Thanks for sharing. 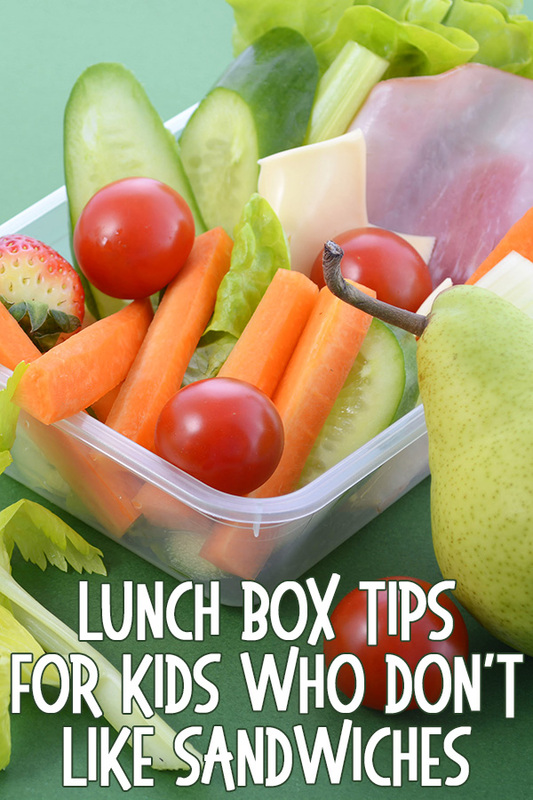 Just pinned it onto our Help with Packing School Lunch Board http://pinterest.com/educatorsspinon/help-for-packing-school-lunches/ For our school lunches chicken Salad in a cute little box with crackers, grapes and cheese cubes is a big hit. I love your ideas! What fun it would be to find any of them in a lunch! I am now following you on Pinterest. I love your ideas and most days I pack our 'home adventureer' lunch boxes like this (2 YO and 4 YO), however be careful with the routines at school and how these might effect how your children eat. There is often a eat before play rule and all children who have lunches that take additional time to eat either don't eat in their rush to play or get left out of games. This is also true of hard to open packages, we spent a week at home playing games so the kids could open their new 'Nudi' boxes easily. In the rare cases we have prepackaged treats I cut the ends of muesli bars etc. Yes they can do it and at home with all the time in the world I expect it, however in the school environment I understand the children's need for haste. Just some ideas to keep in mind as we create these yummy lunchboxes. I agree completely with you point about considering the time taken too eat lunch box foods, Terri. Playing with friends is much more exciting than eating. Our most common entree is Greek yogurt. I buy plain Greek yogurt in a large container a d put a bit with a sweetener into a bowl with lid the night before, store in fridge. Then in the morning I stir in some frozen berries, what kind can be varied. It's yummy, varying fruit varies flavor, and keeps it colder longer. Also Greek yogurt is higher in protein than regular yogurt. Hummus is also a great option for my other kid. My son loves cheese quesadillas with salsa. Sometimes I add a little sliced ham. When I was pregnant and lunchmeat was not an option or not appetising, I ate a lot of bean soups or cous cous with haloumi cheese. It was easy to make aheadand I could dress it up wth raisins and toasted almonds if I had them on hand.. quiche and veggie slice is another favourite. Veggies and hommos. Yum I'm making myself very hungry. My kids' favourite lunch is "bits and pieces" - we have the tupperware bowls with the 3 compartments so they have crackers/biscuits with cheese, luncheon meats, almonds , dried apricots, puffed corn, dry cereal, dip, dried fruit, soya crisps, olives, sundried tomatoes, cream cheese, carrot sticks, celery sticks - a combo of whatever we have on hand! Immy loves tuna too, Dannie :) So glad to help. Glad to see you on Pintrest. I spent a lot of time there while my daughter was nursing. Christie, thanks for the ideas, I always like to be able to give parents some ideas for the lunch boxes, especially if it's their first child or a non-bread eater. I had one little boy this year who had corn on the cob & chicken drumsticks, as he was not so fond of bread. Thank you for the suggestion, Kierna, Immy loves corn on the cob at dinner time so I will have to add it to the lunch list. Thanks for the ideas and leading me to your boards. We live in Nebraska in the U.S. and our state being big on beef has decided to continue to serve dog food, I mean lean beef trimmings to our kids in the public schools. So I have to get into gear and have all the ideas for lunch ahead of time, might be a bit harder since I am trying to go back to school myself so thanks for the help! Oh no, Timmi, I am sorry to hear that. Hope you find a little inspiration here. I use a mini ice brick (or two in summer) and pack everything in an insulated bag - both of which I bought from Kmart. It's also a good idea to practice them with food in them, not just empty. And for the parent/lunch packer to practice, as well. I *cough* may have tightened a thermos too tight once to the point where the kid I baby-sit's teacher had trouble getting it open. I just started showing my son the bento style lunches. He was interested ( not going all out with cut outs, he will be in 5th grade) One thing he agreed on was hummus sandwiched between Ritz crackers. Thanks for linking to my oven baked nuggets recipe Christie! My oldest son doesn't like sandwiches either, and can't eat either dairy or eggs, so he's always a challenge to pack for. I have sent him many days with homemade soup in a thermos, because I can pack many different kinds. This is his favorite. I also have sent him with shredded chicken or pork I've cooked ahead of time and heated. We sometimes make chicken wraps, where he takes fake ranch dressing and chicken with cheese in a tortilla. We've also done nutella and bananas in a tortilla. Great ideas! A container of hummus and a baggie of Stacy's pita chips is a staple with my non-sandwich eater. Also, she likes to take cold cheese tortellini is a little chilled container. Oh, I wish my mom had this for me as a kid! I've never liked bread. My lunches were always so boring and repetitive! Such great ideas! I got so bored with sandwiches as a kid, then Mom switched to Lunchables to save time. 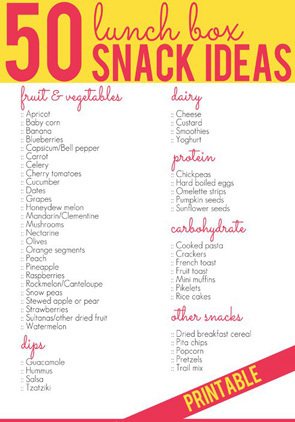 These are great, healthy alternatives! I enjoyed your links and your suggestions. Thank you for livening up our lunches. Wow, after reading this article and comments I realize I have it really bad! :-( My son won't touch any of this with a ten foot pole....my daughter on the other hand might. I'm wondering though, some of these foods I've known to eat only warm, how would I keep them warm (so that they are still tasty)? Clearly using a microwave to warm up food isn't an option at an elementary public school (or any that I know of). Boy, I really have to get creative, please help!! I was wondering the same thing. And scrolling down to see if anyone else had the same question. How to keep those savory pizza rolls warm and not soggy. I asked my son if he wanted to take some pizza left over from last night in his lunch and he said, "Cold?!? No way Mom." I use the thermos containers a lot to keep warm food warm. My kids love dumplings, I heat them up in the morning and pop them in the thermos. If you want to add a lunch note, please check out my site, http://littlelunchnotes.com/. Every school day I post free printable lunch notes. Illustrated jokes, fun facts, etc. - please take a look. For some serious lunch inspiration, go to the weelicious page on facebook. Go into photos then albums. There are 4 albums entitled school lunch. More then 300+ ideas for school lunch. This is Catherine McCord's page. She also has a website http://weelicious.com/ Lots of great healthy recipes for kids. I have been making recipes from her for almost 3 years now. My son loves them. Many things can be frozen as well which is a great time saver. There are so many great ideas on here! Sushi rolls are definitely a hit (and the look cool). Nutritionist Paula Scromeda suggests some healthy lunch ideas as well: http://www.chatterblock.com/blog/sf-bay-area/?p=479 I love finding cool lunch ideas on Pinterest too. Rainbow spaghetti was a recent one. I'm a mom who's a for are teacher as well, and my issue has always been how to get my son to eat nutritious COLD lunches because none of the thermoses keep food warm til lunch time. Now he primarily eats peanuts and crackers! He won't eat sandwiches of any kind and won't eat cheese despite the $20 lunch bag I invested in which keeps it cold til 4! I need help finding alternative foods that a FUSSY eater will take. Any suggestions?? 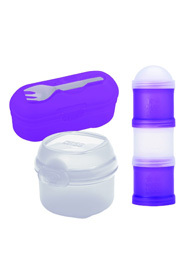 To make your food stay hot and fresh you can put it in a thermos. 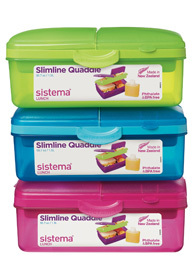 containers, you'll be so sure that your kids will enjoy eating their pack lunch while it is still hot and fresh. can you talk like an adult?